Launch day arrived at last. But it was a day of The Good, The Sad, The Bad and The Ugly. 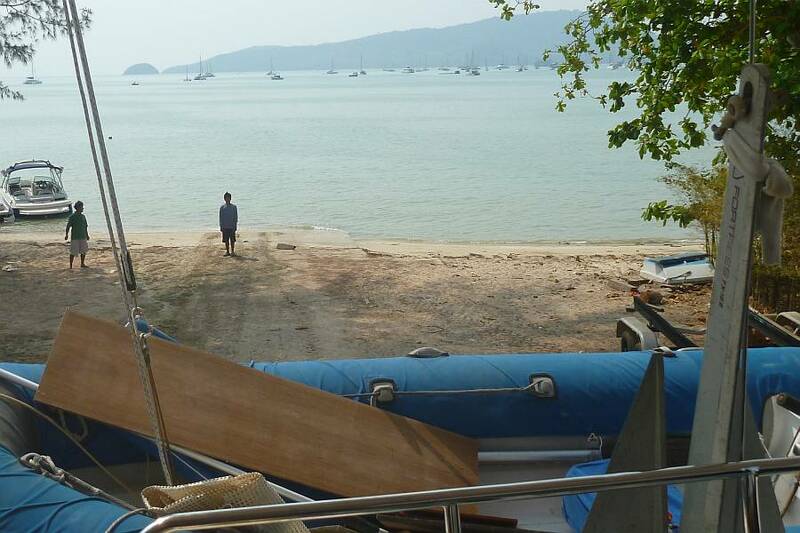 The Good, of course was that we were successfully launched into the Andaman Sea at 11:30, on the rising tide. It had been a hectic morning, though. Sue drove the borrowed car to the yard before 7:30 to offload the last stuff from the apartment that we hadn't taken in the truck on Sunday. Then she and the men schlepped the last of the boxes up onto the tramps, which made Ocelot look more like a container cargo ship, than a sail boat! Jon and Heru managed to slide the longitudinally sliced PVC pipes up the cap shrouds, with big custom made plastic washers between each section. So now we have blue cap‑shrouds. Baw got the nav‑table mounted, so Jon could mount his nav‑computer there and plug it into Ocelot's electronics, especially the GPS and AIS. We have every intention of needing some navigation tools. Houa finished up the hinges on the cockpit table and got it back aboard and mounted just in time. He'd dismounted the aft half from the steel supports to get the hinges mounted, and getting it put back required wedging the posts apart slightly so the screw holes would line up. Bruce from Migration was down from Ao Po (about 25 miles north) to help with the launch, and he and Jon got the chain locker gear stowed, then addressed the washing machine. We didn't want it up on deck in a rolly anchorage, so it had to be secured in the port fo'c's'le. This meant mounting 2 pad‑eyes to the aft bulkhead of the fo'c's'le. Since this bulkhead has a balsa core, Jon couldn't just screw into it, but had to use bolts with nuts put on the port cabin side of the bulkhead, which meant the headliner had to come off. But the forward cabin headliners have to go in (and come out) in a specific order, and that forward‑most piece is the last one to come out, so ALL 6 headliner pieces in that port forward cabin had to come out. 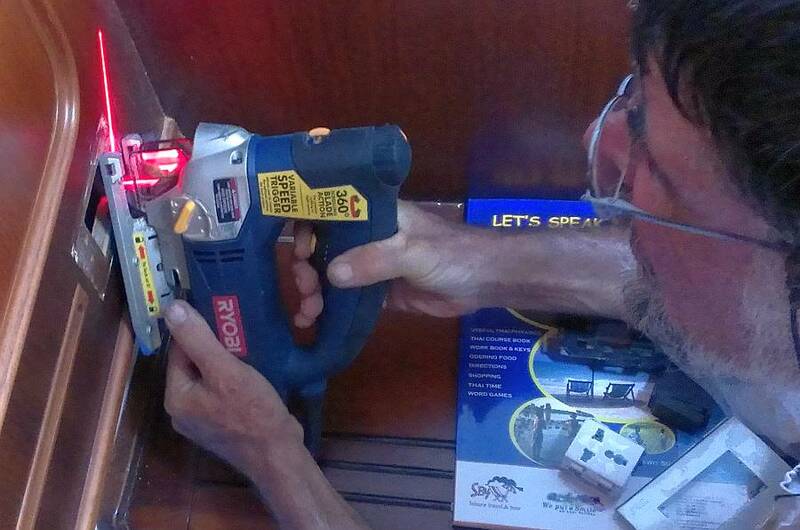 Baw and Heru had done that on Sunday, so Jon and Bruce got the holes drilled and the pad‑eyes mounted. Then Baw and Heru put all 6 headliner pieces back in the forward cabin while we were on the ramp. Sue's main chores were not at the yard. Number one was the bank. We had to make our final payment before we got wet. No Cash, No Splash is fairly standard worldwide. We also wanted to print and laminate letters of recommendation for the last 5 men to work for us: Pla, Heru, Baw, Houa and Lek. And we made each of them Certificate of Appreciation posters to thank them for all their hard work. Sue had done all this work on the computer already, but had to take the USB stick to our local stationary store to get the prints and laminating. And the service line was long and slow. She also bought a string of 1,000 firecrackers and 2 bright yellow good luck leis for Ocelot's bows. After checking out of the apartment and grabbing food for lunch, she hightailed it back to the yard to find Ocelot already on the ramp with the tractor ready to go. Sue handed the firecrackers to Lang, the yard manager, then rushed off to the office to pay the bill. The Sad part of the day was that everything was so terribly rushed that we didn't get a chance for a calm, thoughtful thank you and goodbye to the men. Lang was literally hustling us along, tapping his watch, saying time to go! The ladder was removed the minute Sue got on board and we had to beg the yard to wait so we could pay the men for 2 days, give them each a one week bonus, and give them the recommendation letters and certificates. We had only moments to do so, and sadly Pla wasn't on board, so we missed seeing him entirely. The men climbed off Ocelot as we were rolled backwards down the ramp. 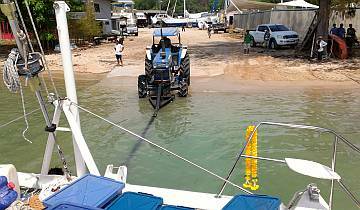 Normally, when a boat is launched, the yard supports it in the water on the trailer for a few minutes while the owners check the bilges and engines. Well, the 1,000 firecrackers had barely finished when Ocelot hit the water and the yard workers (not our men) pushed us off the trailer. Jon had just popped into the port engine room to jump start the engine and looked up to see us afloat, and drifting backwards. Sue got starboard engine started and backed us away from the beach. Forget about checking bilges, we were afloat! So it was exciting, tense, and a strange let down with the suddenness of it all. We picked up a free government mooring in Ao Chalong Bay while we checked the bilges with Bruce, then Jon took him back to shore in Tomcat (who ran quite well, thank you very much!) Sue checked that things were secure enough on deck to move the boat up the island, and when Jon returned he fired up the computer with OpenCPN navigation software. Once we were sure the GPS and the computer were communicating happily, we dropped the mooring and headed north. It was a little tense, as we didn't have an operational depth sounder, but we did have our old tracks from previous trips up the coast, and the tide was high, so we were OK with that. 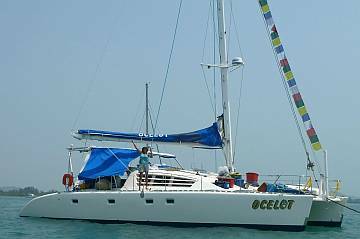 Ocelot motored along at a pleasant 7 knots, and with lots of power available, Jon started the water maker for the first time in 2.5 years. The watermaker has been "pickled" in preservatives all this time, and the unpickling procedure takes a while. First the pickling solution has to be flushed out of the system, then the system can be pressurized to begin making water, but only for washing, not for drinking, so we put it into a jug instead of the tanks. 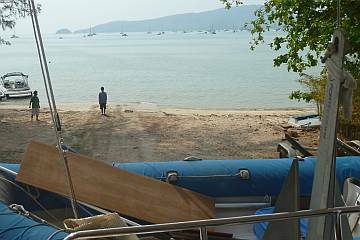 Three hours later we arrived in Ao Po and again picked up a free government mooring. Time to start making Ocelot habitable. Sue found the bags of clothes and filled our lockers, then found clean sheets to make the bunk. But then Jon beckoned. Trouble! There was more water than there should be under the port cabin floor, near the water maker. 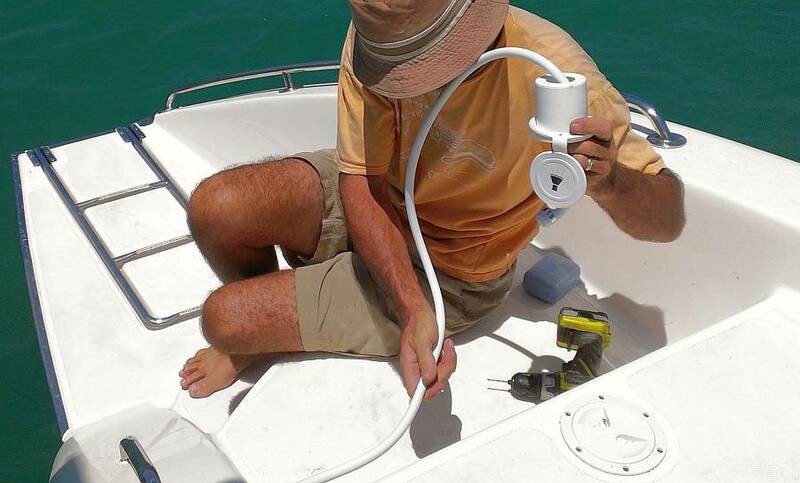 We used the new bilge‑pump to pump it out, but it kept refilling. Where was it coming from? We tasted it: Salt. Bad trouble! 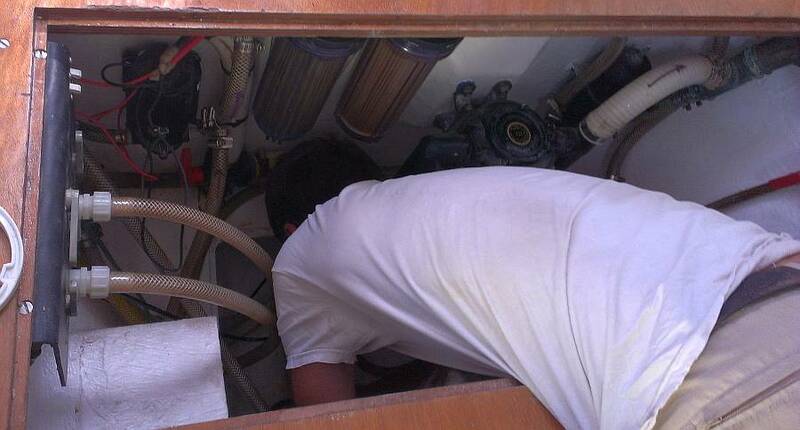 Time to look in other bilges. Oh dang! The port foc's'le was way full of water, all the way up to the base of the washing machine, about 2 feet! We quickly untied the washing machine and lifted it up on deck. Jon shut down the watermaker and manned the manual pump that services the fo'c's'le. Sue verified that the pump was working and she started bailing the fo'c's'le with a bucket. We thought maybe the new depth transducer in the very bottom of the fo'c's'le bilge was leaking, which would be a bear to fix at sea. When we finally got the foc's'le empty, it stayed that way, and our heart rates came down a few notches. The depth transducer wasn't leaking at all. So where was the water coming from? Frazzled, exhausted, and emotionally drained, we had just started to relax and plan our evening with Bruce and Alene on shore when The Ugly happened. One of the day charter power boats roared up behind us with the skipper leaning out, fist clenched, screaming, "No, No, No. You no stay here. My place. My mooring. You go. You go!" When we said, quite calmly, that this was a free government mooring and it was for everybody, he swung his boat around towards our bow, pulled a knife, and threatened to cut our lines! In our exhausted state this argument was the last thing we wanted or needed. We told the skipper of Silver Bolt that we would call the police, and he said "OK. You call police they make you leave!" We called the tourist police (1155) who put us through to the Ao Po Police, who didn't speak English. But they called us back, with a woman who spoke some. Unfortunately, we realized this was a dead-end effort, as it took more than 4 phone calls for them to even understand that we were not on a motorbike. With nasty Silver Bolt still circling and yelling we finally dropped the mooring and motored to another one. Yikes. What a day. What an emotional wringer. The day ended well, relaxing with Bruce and Alene, sharing a celebratory champagne, then enjoying a yummy Thai dinner in the village. We slept that night on our very own Ocelot. It was great. Home at last. Here we are afloat on the aqua‑blue waters of Ao Po, ten days into the Refit Rehab phase. No, the Refit isn't over yet! We're still installing stuff that was taken off, bringing up the many systems, and trying to make Ocelot more habitable. The main thing that has changed is that with no workers to supervise, we 2 are doing all the work! And at night we have no cool apartment to retreat to. Life on Ocelot this week has been no picnic, that's for sure! Jon solved the salt water in the foc's'le issue by connecting the washing machine to its appropriate hoses, then we ran the watermaker and were happy to find that the water purity, measured in parts per million (ppm) of total dissolved solids, was a very acceptable 223 ppm (less than 500 is considered good, but most people can't taste salt until it gets over 1,000). 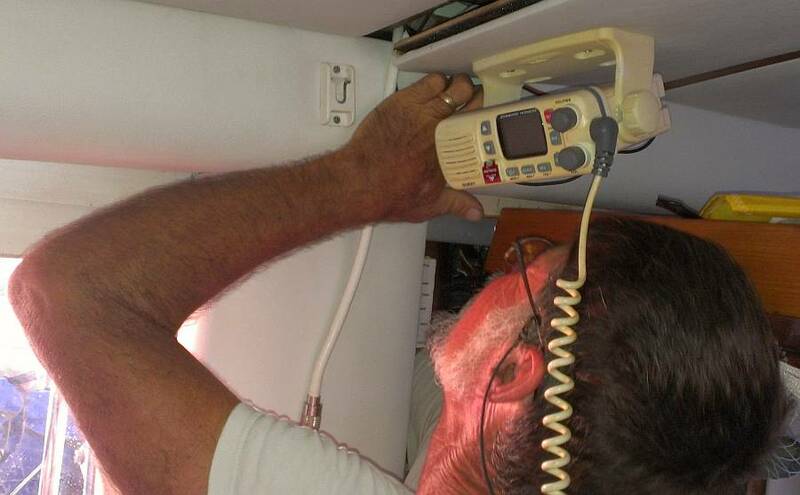 But the output volume was below par, and we were finding salt water in the cabin bilges under and aft of the watermaker! Would this never stop? 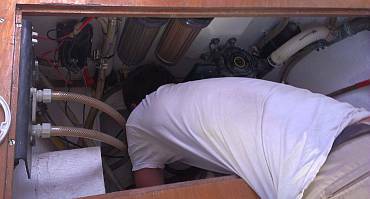 Jon tracked the problem to a one way valve that had some debris in it, and by running the bilge pump he was able to blow the debris out. We also found that one of the product (fresh water) hoses on the Spectra was leaking where one of the workers must have nicked the plastic with his razor blade when painting that bilge. So Jon cut the hose and put a pressure joint in the line, replaced the sight‑tube that shows how much water we have in the port tank, and cleaned out the flow meter as well so we can tell how much water we're making. Unfortunately, this led to another problem, as we discovered that the watermaker was producing (quite good) water on one stroke, but not on the other. We emailed Spectra in the US but got no response (Glenn, who was so responsive and helpful in the past, has left the company). The local Spectra repair shop in Boat Lagoon said that the Clarke Pump is not supposed to be pickled for 2.5 years and that the seals were probably all shot, but they've got a full set of seals and they should be able to repair it. So Jon spent the next morning removing the Clarke pump from under the bunk step and was happy to turn it over to the experts (who came to Ao Po to pick it up). 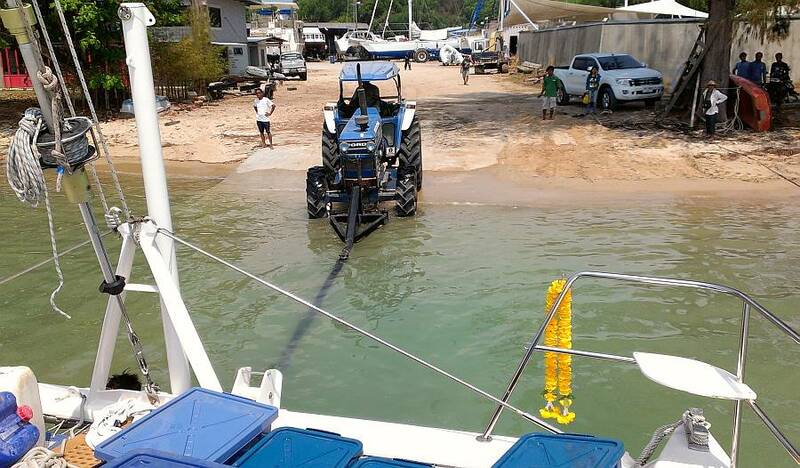 Our (brand new, $500) depth sounder is refusing to work. We've installed a second depth transducer that connects to the radar display, but the radar a lower priority job right now. So Jon took the RayMarine depth display (what they call a Tri‑Data) to Octopus Electric in Boat Lagoon, the local fixit shop. Two days later they called to say that the display was ready to be picked up, at a cost of $27! Getting the boat more livable was our daily chore. Sue located all the salon and master cabin mosquito nets, washed them, then got them in place by the second evening. 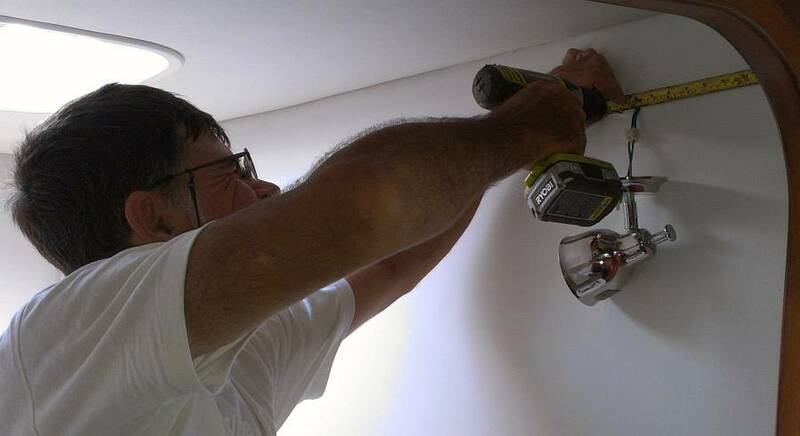 Jon had to tighten all the hinges on the hatches to allow them to stay open at half‑mast, which is the only position the tent‑like mosquito nets work. Jon mounted the reading lights in our cabin (we already had LED lights up in the salon and galley) and of course got a toilet working! 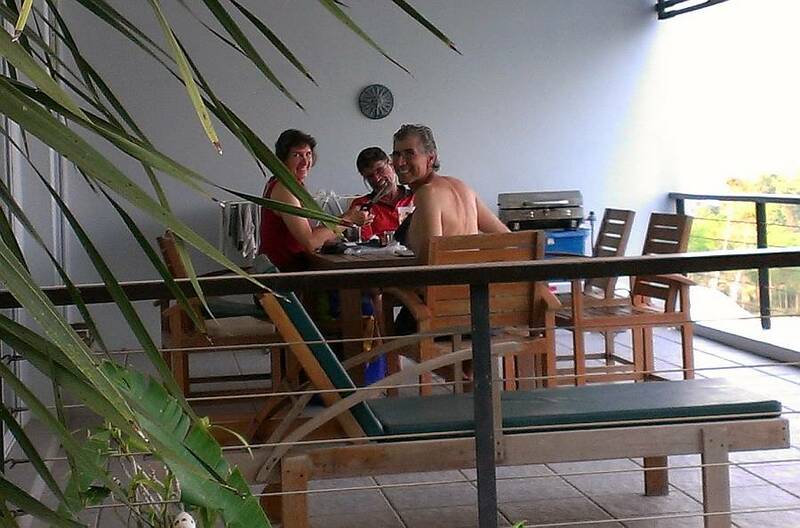 Bruce and Alene have been our amazing land‑based support system, loaning us their scooter so that we could retrieve ours 25 miles south in Ao Chalong, and letting us do laundry and swim in their pool up at Sumptuous Villa. We took one whole day to run errands at Boat Lagoon, to pick up things we'd left at the boatyard, and to get our scooter. Then, since we still didn't have much food aboard, we hit the grocery stores. But provisioning on scooter is not very efficient! One packet of rice, 2 packets of noodles, some curry pastes, cheeses, oats, fruit and veg. Luckily there are local markets just a few minutes (by scooter) from Ao Po, and we have been able to get fresh squid, pineapples, hydroponic lettuce, ripe tomatoes, and chicken satay. Yum. Sue finally cooked a meal aboard on our third night afloat. Sue's big job everyday is to unload the 25 boxes that have been stowed all over the deck and trampolines. She is updating the inventory on the Boat Gear spreadsheet that she and Amanda started many years ago, and it's helped us remember just where we put all this stuff! We have huge black plastic bags of trash each day to take ashore, and increasingly full boxes of "give away" or "sell" items. But the stuff to put in lockers still seems endless. 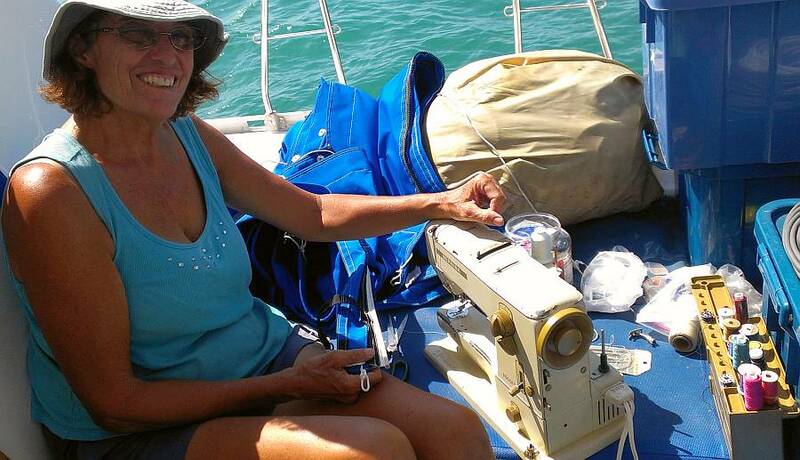 Between unloading boxes, Sue also continues as Jon's assistant for boat projects, especially helping to find the bits and pieces he needs to re‑habilitate Ocelot. Being moored in the middle of a bay of long‑tails and charter boats means we need to have good lights on Ocelot, so Jon got the cockpit lights mounted in the targa bar right away (and it was nice to get the targa bar all closed up and those big fiberglass panels out of the way!) Then he spent a whole day on the mast electrics. He connected the masthead anchor and tricolor lights, the backup running lights, the steaming light, and the foredeck lights. He ran the antenna cable for the VHF radio under the headliner (that was a chore!) and got the radio mounted, so we now have VHF communication! 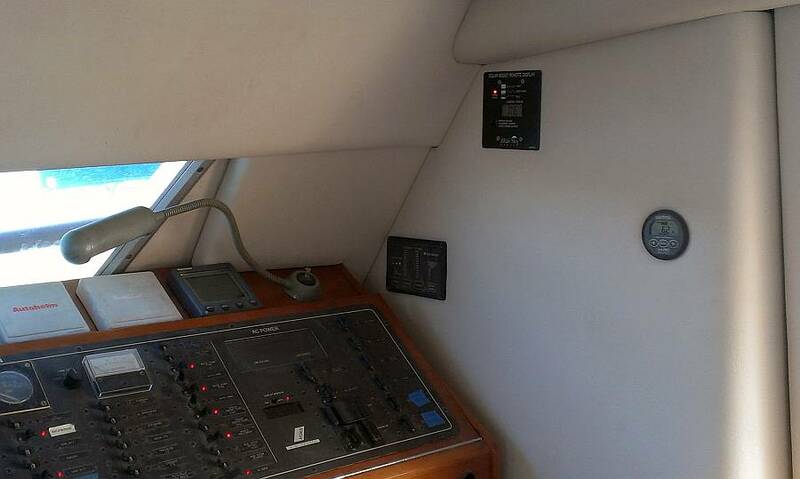 We were happy to see that the LED masthead light is beautifully bright, as are the LED tricolor and foredeck lights. Interior electrics got the next attention, and it was pretty much an all‑day job to rip out the old plugs, switches, and cover‑plates, and replace them with new units. All the cabins have lights and 110vAC (the American standard) and now the forward cabins (and the galley) have 220vAC as well (the standard everywhere else except Japan). This involved some woodwork as the new plates didn't always fit where the old ones had been. Jon also mounted the inverter controls, the solar charger controls, and the amp‑hour meter in the headliner wall next to the nav‑station, and mounted the wall itself, so we're looking more put together everyday! We've had lots of calm weather, but also a few days of surprisingly windy weather as well. After a night of winds gusting in the high teens, we found that the new bimini shades were not staying in place, which made them pucker and flap. So we unzipped the 2 huge side flaps and Sue spent the morning with her trusty sewing machine adding tie‑strings to the aft end of each shade so we can secure them to the targa bar. To further improve on our life aboard, Jon got the new shower hoses installed on the sugar‑scoop steps, so now we can shower on the aft deck, just like real yachties! 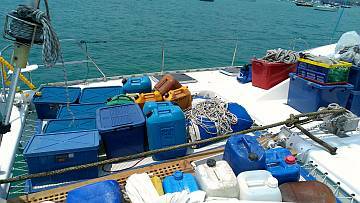 Sue finally had a huge pile of empty plastic boxes, which we wanted to give to Houa and Baw, and we wanted to pick up our polyurethane and Epifanes varnish that was left over at the boat yard. Not things we could do on a scooter! 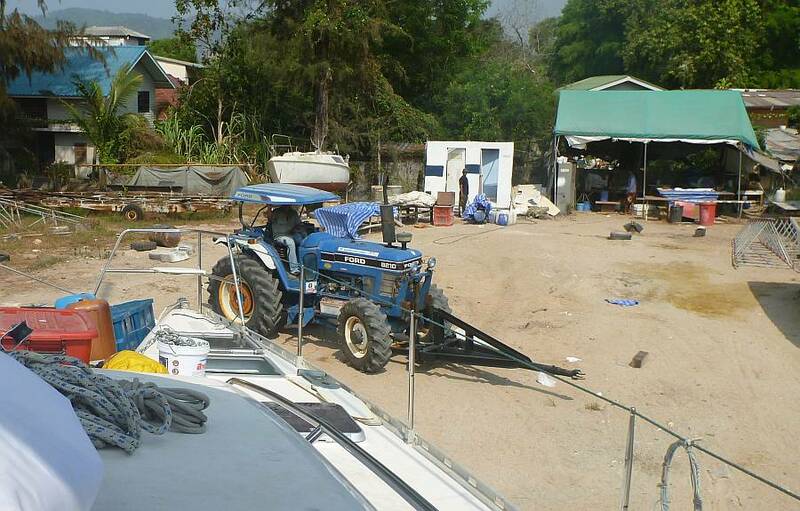 We were fortunate that Gerry of G&T Boatyard (just ashore of us) offered to loan out his big truck. So Sue spend most of one day driving (with another yachtie couple) down south on a shopping and delivery mission. This last day has been a tough one as Sue hurt her back moving all those boxes, so she's moving pretty slowly, sorting prescription drugs (most now out of date) and first aid supplies. Jon has gotten some great work done on the rigging. He braved the rolly anchorage yesterday to climb the mast (on the new steps!) to take the ropes aloft for the Lazy Jacks . Lazy Jacks are the ropes and block system that attach to the mast and hang down to support the sides of our huge mainsail cover ("stack pack"). The Lazy Jacks guide the main as it comes down so it falls neatly into the cover and all we have to do then is zip up the top. 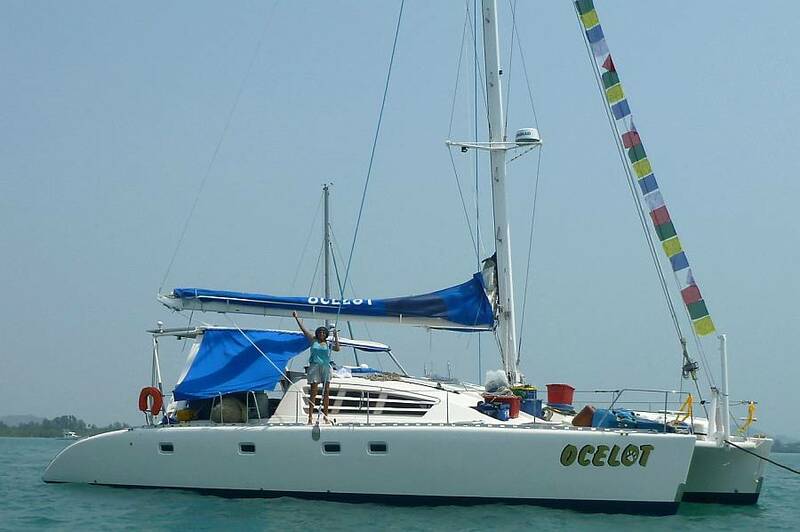 So now we can see our lovely new OCELOT logo on the mainsail cover. When Jon started finalizing the roller gear on the forestay, he discovered that our new Hayn turnbuckle barrel had shoulders on it that made it too wide for the ProFurl base to slide over. 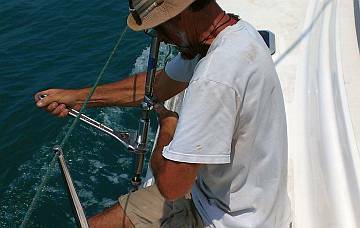 Luckily, we still have the previous turnbuckle (which has nothing wrong with it) but changing headstay turnbuckles while the mast is up is not for the faint‑hearted. Jon backed off the tension on the cap‑shrouds, then used 3 of our halyards to pull the mast forward. With the headstay now loose (and most of the wake‑causing day‑charter boats off on their trips) we could swap the turnbuckle barrel for one of our spares. Then we tightened the rigging back up and finished connecting up the roller gear. We mounted 2 of the 3 rope fairleads for the furling line, but one of them seems to have gone walk‑about, so we'll mount it when we next come across it. Jon spent the afternoon disassembling, mounting, and reassembling 2 spring‑mounted blocks that sit on the back of the mast and are used to guide the mainsheet and the vang from the boom back to the winches by the cockpit. They look simple to mount, but actually they have to be pretty much taken apart so that the bolts can be accessed. This took several hours of engineering, and lots of SuperLube grease to ease things along. By late afternoon Jon had the blocks in place and the vang and mainsheet run along the deck and back to the winches. We're looking more and more like a sailboat! Sue's request of the day: a fan in the salon so that the evening "close‑down" for mosquito time isn't so hot and stuffy. So, just before the evening bloodsuckers descended on the anchorage, Jon got a new Hella fan mounted near the galley on the port side of the salon. Ah, cool breezes! The rehab continues, with the depth sounder hopefully now repaired by the Ray Marine folks, the Spectra Clarke pump still in the hospital, and 5 boxes of books still to unload once we get the bookshelves up to put them on! With cruising friends joining us in 4 days we've got to stay focused!